How do you go about planning and executing above steps? Most of the time we do all the above activities individually- we research on a destination in google, check reviews in other sites, we check with friends for recommended places to explore or we google it out. Then you need to put things together and plan your trip- when to start, where to where in what mode of transport, what to see, where to eat, sleep and so on. Each one of us are unique- our preferences on what we want to do at the destination (explore/just relax/take photographs/shop etc) differs, our preference on travel differs (few are fine with driving overnight, others prefer comfortable day time travel and night rest, few wish to stop at every interesting place on the way, while others wish to head to destination straight and so on). Because of this, standard itinerary on a travel website won’t suite us, even our own friends’ or relative’s plan may not work for us, so almost all the time we will have to spend lots of time and effort customizing the roadtrip. 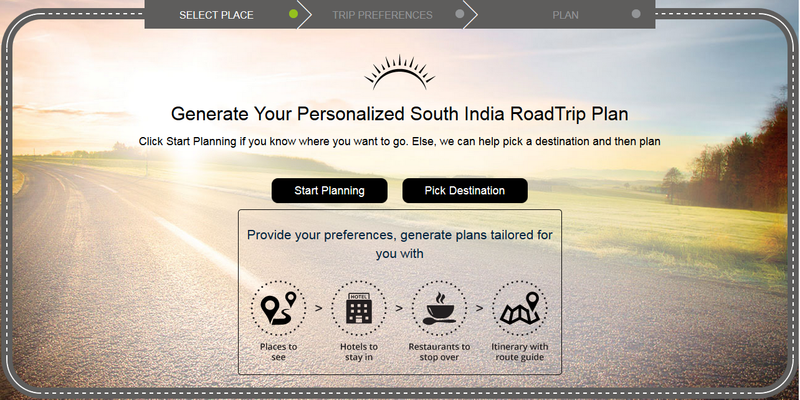 How nice it will be if there is a website/app/product to simplify roadtrip planning and execution? GoRoadTrip.com is a new travel start up that focuses exclusively on road trips- trips to nearby destinations which you would cover by car (or may be bike). GoRoadTrip has built an extensive listing of attractions and things to do/places to visit in all over South India. The website has a powerful engine that can plan the entire trip for you, based on the input given (Destination, time, profile (wildlife/beach/adventure/heritage etc). Overall, GoRoadTrip is a good product those who wish to have a quick roadtrip but do not have lots of time to research and plan the trip in detail. Instead of researching at multiple places and spending time and effort to draft a plan, you can let GoRoadTrip suggest a plan and then fine tune it further as per your taste and preferences. I am told GoRoadTrip team has personally explored and verified most of the attractions/cities covered by the site- thus be assured information is reasonably accurate and first hand. GoRoadtrip claims to have 75000+ Itineraries from over 27000+ users. If you don’t have any particular destinations in mind, you can simply browse popular itineraries from GoRoadTrip and pickup one. GoRoadtrip.com is a great product for people who are looking for personalized trips instead of standard packages which other websites offers today. I have spent some quality time on GoRoadTrip and found the concept useful, as it saves time I otherwise have to spend researching a destination. Do check it out- they are strong in South India at present and expanding. When you have those kind-of-unplanned trips; like when you don't have time to do homework, this would be great.